ESPAÑOL What is autonomy? Santa Cruz, Tarija, Beni, and Pando, four of Bolivia's nine states, have for many years demanded that each of Bolivia's states be autonomous. They believe that every state should have its own decision-making power over the use of its resources, the income they provide, and the state budget, similar to (but not exactly the same as) the U.S. system in which each state can make its own laws, vote on its own budget, and determine the use of some of its own resources. At this time the Bolivian government is centralized. This means that all states must remit their earnings to the central government which then decides how to invest those earnings in the country. Of the total earnings, a small percentage is sent back to each of the states; however, the central government decides how much to send. Santa Cruz, Bolivia's largest department, produces 64% of all the food in Bolivia and nearly 40% of the total GNP (gross national product). It is one of the fastest growing and most populous regions in Bolivia and most of its population growth is due to a rapid influx of immigrants from other regions of the country, many or most of whom settle in Santa Cruz but work informally, meaning they do not contribute or pay taxes. This puts much strain on the Santa Cruz economy as population growth also means more and more must be invested in infrastructure such as pavement and roads, transportation, schools, medical centers and hospitals, electricity and water, sewage and trash pick-up systems, and much more. Yet Santa Cruz receives only a tiny percentage of what it remits to the central government for investment in these services. The majority of its remittance is disbursed among other states or invested by the government in other things such as specific national programs or purchases that Congress approves for it. Santa Cruz, Beni, Tarija and Pando are all states located in Eastern Bolivia, an area of the nation that was largely ignored throughout the past 500 years. Governments came and went but none invested much at all in this region. Most industries, agriculture, and other businesses were developed privately, and many individuals, families and local companies also invested in public works and other public construction and infrastructure that the central government should have paid for, simply because if they didn't, these things would never have been made available. It wasn't until vast fields of oil and gas were discovered just a few years ago that the government began to pay attention to the region, due to its obvious income generating potential. The government very quickly nationalized all oil companies, most of which were being operated by foreign companies. Santa Cruz has the country's best operated public service companies. It's water, electricity and phone companies are all cooperatives, meaning that each user is actually the owner of a share in the company. They are not privately owned companies; yet the Bolivian government has threatened to nationalize them too. Similar events are taking place in Tarija, Beni and Pando. Therefore, the four states each held a vote for or against autonomy. They did this through lawful referendums which were publicly held in each state. A referendum is a public vote not ordered by the central government, but ordered by the people themselves to take place. The people of the Eastern states of Bolivia, by a vast majority, publicly voted to order each of their governors to declare their states autonomous and draft statutes. In each of the four states the YES vote was over 80% during these referendums. 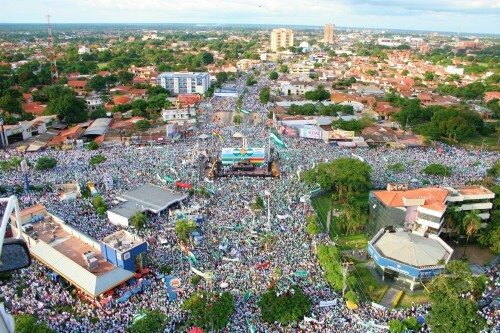 The most famous of these was the Santa Cruz referendum - which was attended by nearly one million people who filled the city streets as far as the eye can see. It has come to be known as the "Town Hall Meeting of One Million People". In this video you can actually watch one million people ordering their governor to declare their state autonomous and draft the statutes. Soon after, Beni, Tarija and Pando followed suit and in each state over 80% of the population voted for autonomy. Not long after this, Cochabamba did the same with similar results. Soon all nine Bolivian states were given autonomy. However, the government quickly established a Ministry of Autonomies to centralize autonomy, which obviously defeated the purpose. The Bolivian government has made every effort to describe the cry for autonomy as a vote to secede from the Republic of Bolivia and form a new nation. Supporters of autonomy are described as separatists and enemies of the state. However, by law the government is obligated to acknowledge the vote of the people. Now, all nine Bolivian states are autonomous, per the new Bolivian constitution which was approved by about 57% of the population during a national referendum held on 25 January 2009. You can also download it in Spanish here: Nueva Constitución Política del Estado. However, the government continues to make every attempt to impede the states from actually exercising their autonomy. It has pressed charges against each of the governors in the states that voted pro autonomy (but has not pressed charges against the remaining 5 governors in states that it does not consider opposition, even though they are also by law now autonomous). Although the new constitution declares all Bolivian states to be autonomous, the struggle to take this from theory into practice continues. You can read the: Estatutos Autonómicos de Santa Cruz in Spanish here. You can download a PDF version of the Department of Beni's autonomy statutes too.